Post inspired by a reader. Thank you for your question. See this video for details. NOTE: If the banana clip is not your friend (i.e., too teethy), then avoid this style. 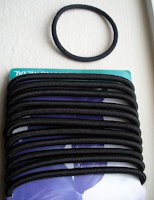 Step 1: Use jumbo ouchless bands as opposed to small ones. Small ones tend to wear quickly and get caught in the hair. I also find that the jumbo bands can go around the hair twice or thrice with less pressure and tension than the smaller ones. Step 2: Use the jumbo ouchless band to make a standard ponytail. 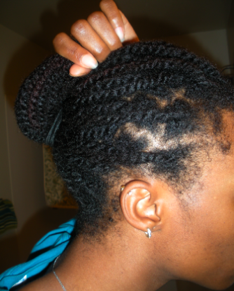 Then flip the ponytail upwards as pictured below. Step 3: Use a large bobby pin (or a few small ones) to secure the tip of the ponytail to your crown. 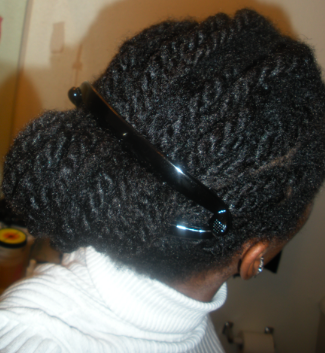 (If you hair is longer, you may wrap the ponytail around a few times before securing the tip.) 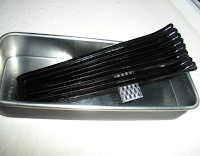 Use a few more hair pins to secure any stray hairs stemming from the bun. NOTE: Do not pin the very tip of the ponytail. Pin about 1-2 inches from the tip, then tuck the tip under the rest of the hair. Woohoo! Thanks for this post, Loo. I love Kimmaytube btw. 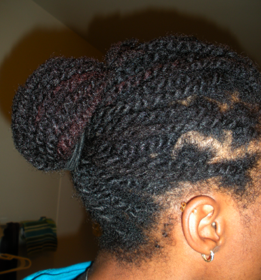 I found out a trick from Kisforkinky's website about how to protect the nape when bunning. Basically, she said to part a bottom section of the kitchen area then flat twist along the bottom of the nape, then style as normal. I feel bad because I could only keep my twists in for two weeks this time..and probably will have to do so from now on due to a scalp condition. But, it does seem that my hair is starting to benefit from keeping in the twists for longer periods. I am aiming for three weeks next time. oh p.s., I normally wear low buns. Your hair looks so healthy and pretty, I continue to scroll through your pictures with admiration. And your twists are very beautiful as well they looks soft and springy. 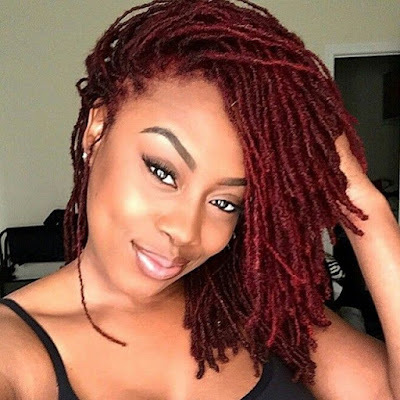 I dont bun my twists now...I just put in about 6-8 twists in the back and 2-4 on each side and just braid it into a french braid and pin in the back i keep like that for 4 days then remoisturize & retwist til wash day...but when my hair gets longer these bunning methods would be nice to try! !